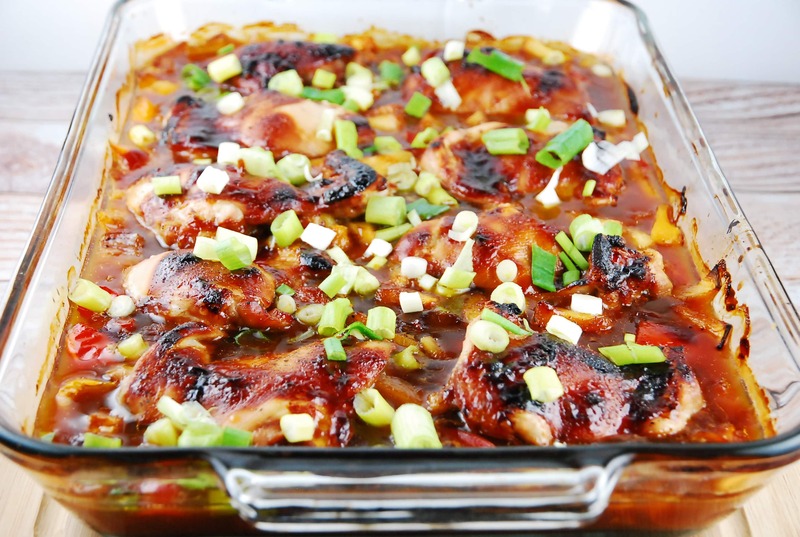 This Baked Hawaiian Pineapple Chicken Teriyaki Recipe is one that my kids ask for again and again. I love that it’s super easy to make, and that it tastes fantastic! Just pour the sauce over the chicken pineapple, and peppers, and bake! You could make this even lighter by using chicken breasts instead of thighs, but my family tends to prefer the dark meat. Breasts would probably work really well though, given that they are cooked in the sauce, so that would help keep them super moist and juicy. Traditional Teriyaki sauces use a lot more sugar, which also helps give a thicker sauce, but this sauce is still deliciously sweet and flavorful without being too sweet. It’s also a perfect topper for steamed rice, which I highly recommend with it. Enjoy! This is a great recipe! I sub the honey with liquid Splenda to save more points, it came out wonderful! For those who have printing problems – just select what you want to print, Copy (ctrl + c) and Paste (Ctrl + V) into Wordpad or any other document program. Recipe still won’t print – only the image. Please fix ASAP. Thanks. Is it ok to use chicken breasts instead of thighs? If so would it change the cooking time? I used chicken breasts and they worked well! I cooked them a bit longer, about 45 min. Just cut the middle and checked inside periodically until they were cooked through. Printer friendly still not working. I have a daughter learning to cook – who is mentally challenged– so I like to print them out for her to read. Help ??? Tried t copy and paste and would not. I just made this and it’s really delicious! Thanks for sharing! Do you think it would alter the WW points much if I added some sliced carrots? The recipe instructions call for garlic in the marinade, but there is no garlic in the recipe ingredients. How much garlic and please add it to the ingredients. Do you not want your recipes to be copied? I know it says printer friendly, but I cannot get the recipe to print – only the photo and the paragraph below it. What am I doing wrong? TO COPY : drag over all text & pictures until all is selected. Right click and copy. Open MS Word, right click and paste. It’s all there. Then print.